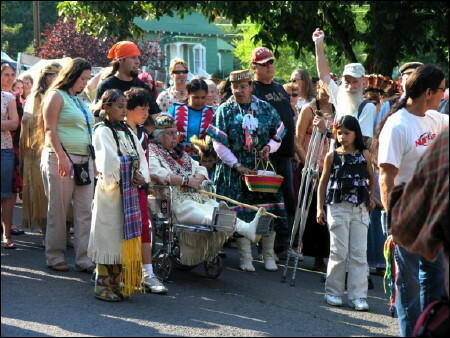 "We Are Here" was dedicated on September 30, 2006 on the 150th anniversary of the forced removal of native people from the Rogue Valley of southern Oregon. Hundreds of people attended stories, drumming, singing and talks before walking down North Main Steet to the sculpture where they were joined by hundreds more for prayers of healing and a dedication led by Grandma Aggie. Streets were closed for the event and the mayor declared September 30 to be Ashland's annual First Nations Day.